With Tequila Suicide, Primal Fear vocalist Mat Sinner's original band Sinner continues with a style that is almost completely unchanged from their glory days in the 80s, just a little older and slower. Anyone who's listened to any of their 21st-century albums will know what to expect: Reliable, solid heavy metal with the hallmarks of the early 80s -- thick chugging rhythms, mid-tempo beats, and incongruous hard rock elements such as love songs mixed in. Sinner is aware of the dated nature of their music and revels in it. Go Down Fighting, a nostalgic look back at their early years, is one of the faster songs on the album with a relentlessly upbeat chorus. Sinner's delivery, his vocals deeper after nearly 40 years, is one of the greatest virtues the album possesses, and the level of songwriting is unsurprising but not offensive; even with mid-tempo songs that occasionally overstay their welcome, Mat Sinner can effortlessly deliver a decent heavy metal album. The production is nicely done and showcases traditional riffing that, if not exactly exciting, is consistent to the point of absurdity. Why is a good example of when Sinner gets their formula tuned just right: Chunky riffs with just the right level of reverb on guitars and drums, a sharp, harmonized solo, and a melodic tune. The flip side of those years of experience is that the sound hasn't aged gracefully, and the slower songs tend to get boring fast. Dragons, a drawn-out rant against feminine betrayal with some fantasy elements pasted on, overdoes the mid-tempo chugging and is an easy one to skip. Too many of the songs just sound like filler: Gypsy Rebels may have the band gang-chorusing about rocking the night, but it sounds more like they are about to take a nap, and so is the listener. On the bright side, Tequila Suicide's refusal to entertain any music than heavy metal of the old school yields an album with little pretension -- they experimented with glam metal in the late 80s, and after that effort was panned, that was enough for them. Sinner can't be faulted for its approach, and like some of their peers, they've held grimly onto every aspect of their sound, the good and the bad. 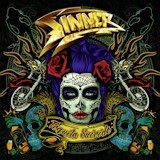 It means that Danger Zone, their third album, is probably going to be the apex of their career, but one can't help admiring Sinner's consistency.